With the coming of the Obama Presidential Center, the continued southward expansion by the University of Chicago and a tentative plan to remake the Jackson Park golf course into a PGA Tour-worthy venue, the fortunes of Woodlawn look to be rapidly changing. 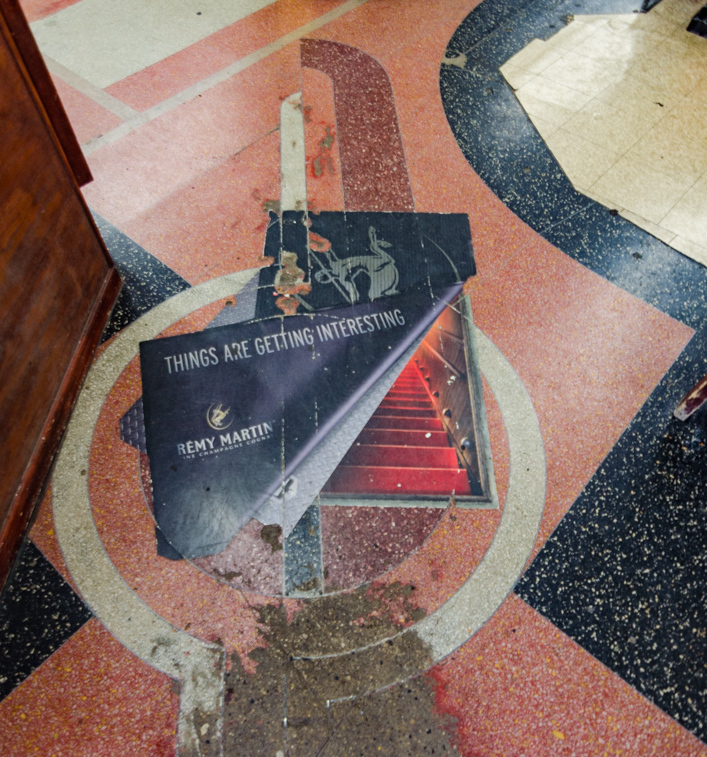 Once one of the city’s largest entertainment and night-life districts, a new spotlight is shining brightly on an area long marked by disinvestment, demolition and decline. 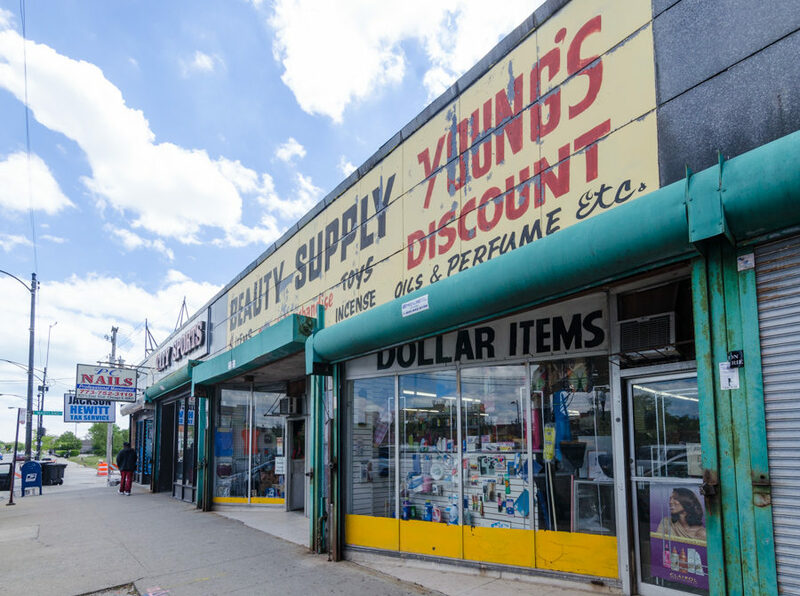 Speculative redevelopment is not only driving construction of new housing, but of mixed-use buildings and even a major grocery store. 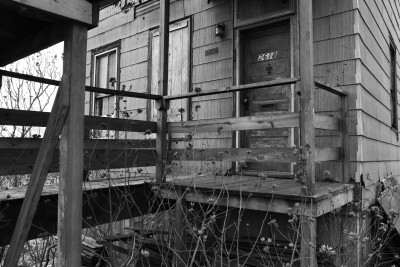 As a result, buildings in Woodlawn that have dutifully stood for over a hundred years are now threatened as the focus turns to making things shiny and new. 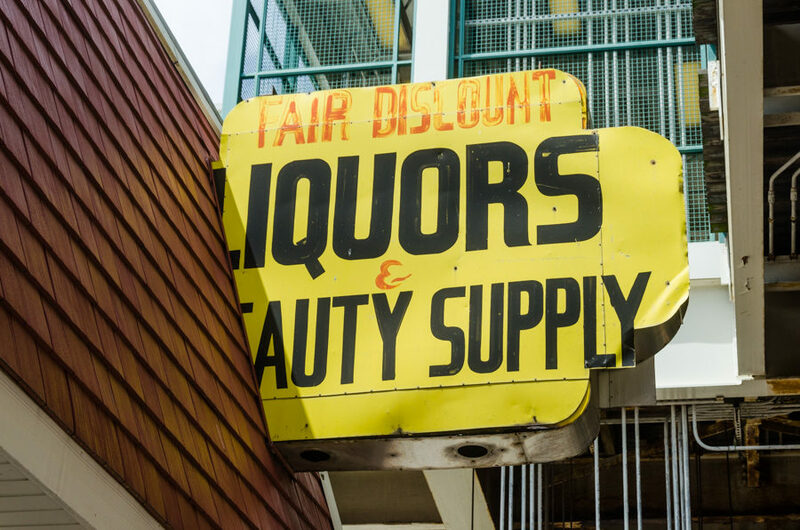 Among those at risk is a block of buildings on the southeast corner of 63rd & Cottage Grove, the few remaining that give any indication of how the area once looked and what kinds of businesses flourished here for decades. 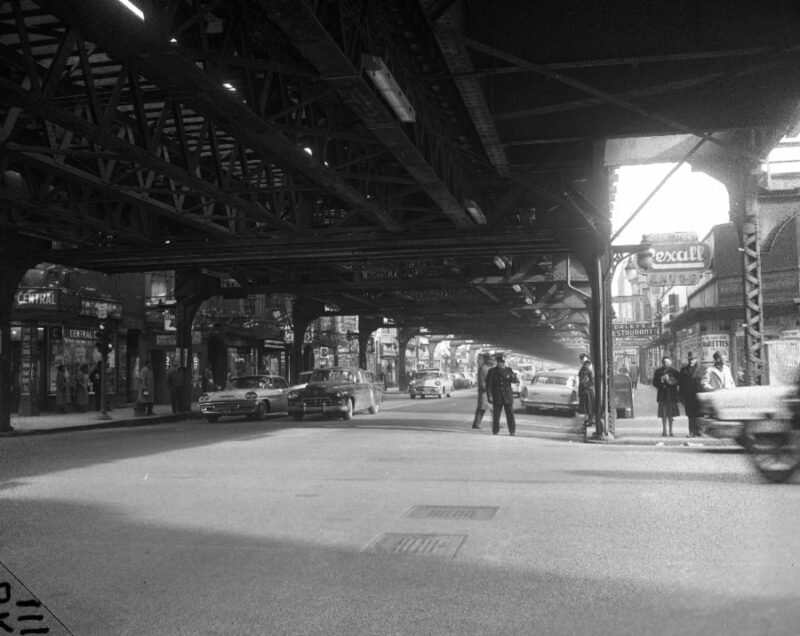 Nondescript, sturdy, and built for function, these workhorse buildings helped to create the commercial district along 63rd Street that included clothing, shoe, and hat shops (aside from entertainment, 63rd was also known as a ‘silk stocking district’), taverns, drug stores and sundry shops. Even today, they still contain businesses that are strikingly similar to those that were here 80 years ago. All of the structures have been altered as needs changed, yet retain features left over from those past decades. 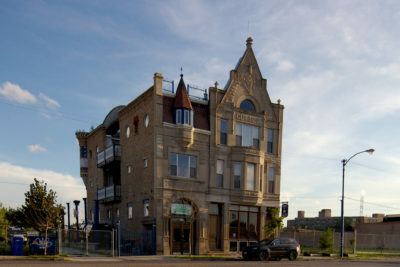 The corner building, from 1906, appears to have been truncated from two stories to one; its storefronts at one time included a lunch counter, taxi stand, cigar shop, shoe store and drug store. 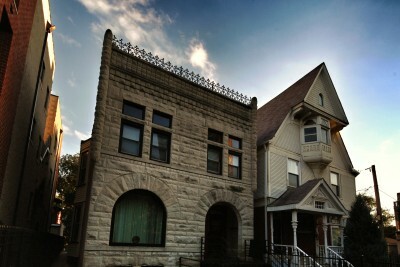 In subsequent years, the side facing Cottage Grove has been given a new brick façade, while the side on 63rd is a mélange of new brick, metal fascia and a mansard roof that appears to cover an earlier Vitrolite finish. 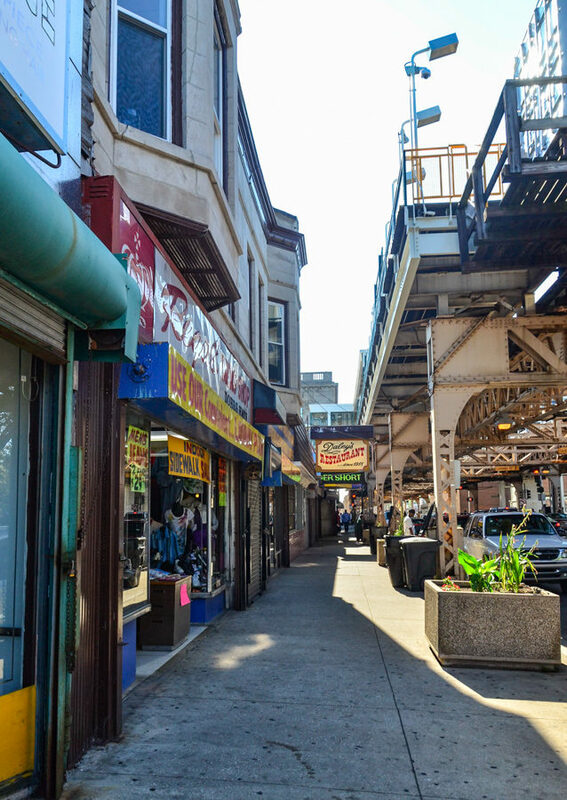 In the easternmost storefront of that building is Daley’s Restaurant, currently the city’s oldest restaurant. 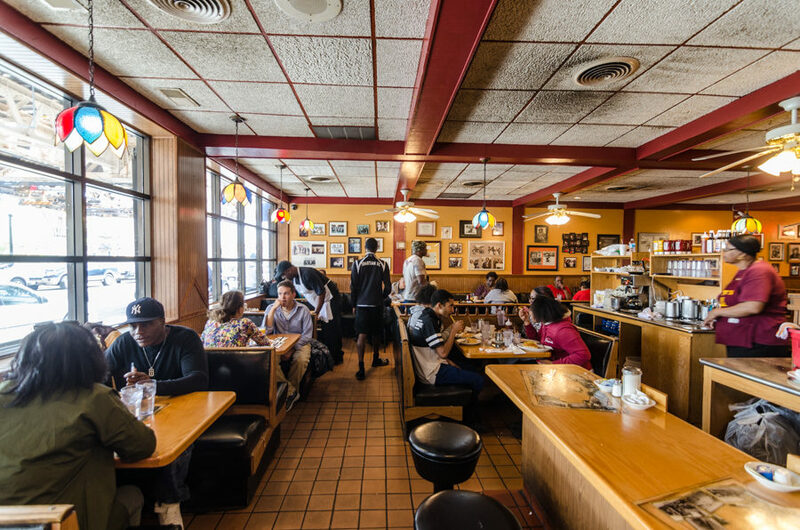 Originally opened a bit further east to feed workers building the 1893 World’s Columbian Exposition, the restaurant was sold to the Kyros family in 1913 and moved to its current location in the 1930s. 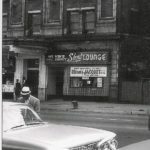 At one time, the current restaurant was L-shaped and had a second entrance on Cottage Grove. The interior has been remodeled and appears to have no remaining trace of its original look. 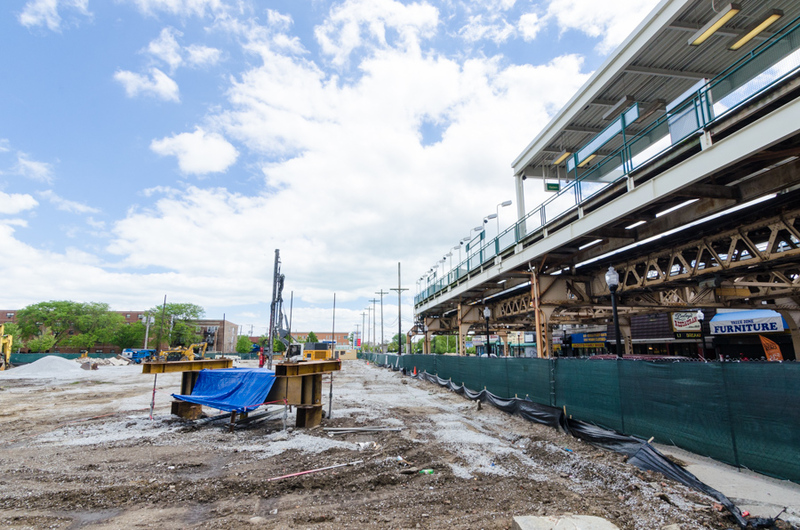 As of this writing, there is an as-yet-unconfirmed plan for Daley’s to relocate to the new transit-oriented development being built across the street. 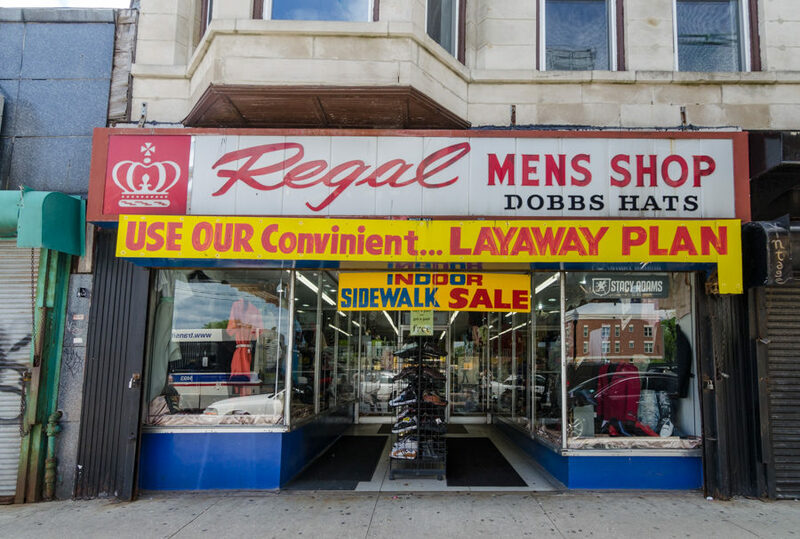 Next door to Daley’s is Regal Men’s Shop, in the only two-story building remaining on the block, built 1904. Occupying this space since at least the early 1960s, the shop was previously three doors east. 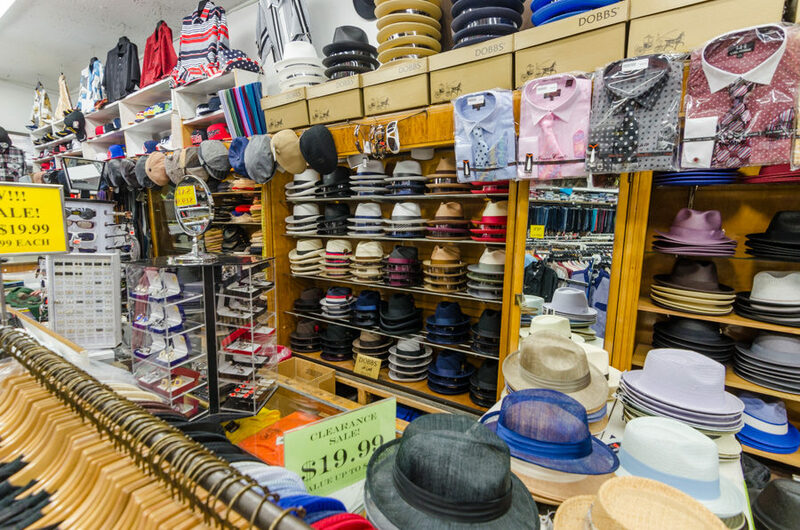 Regal sells men’s dress and casual wear, hats and shoes, performs alterations and offers layaway. 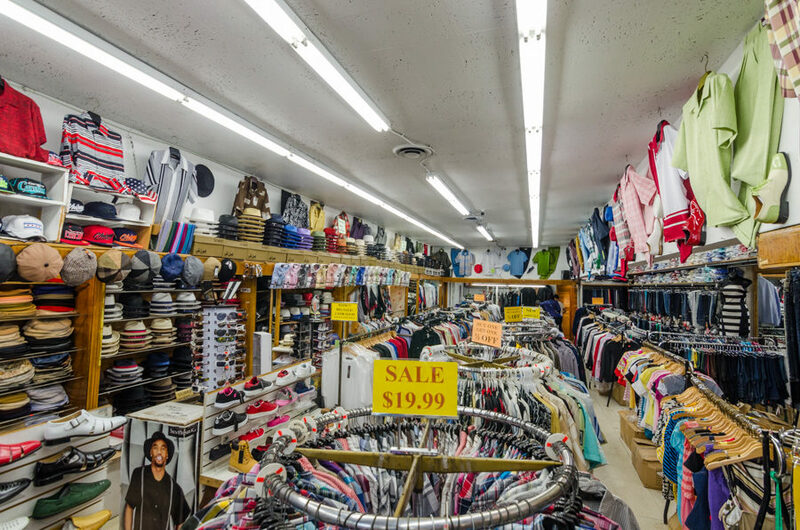 The vintage store fixtures, shelving, and display cabinets, in veneered wood, still function as they originally did. The building’s second floor, used as offices for a physician and a dentist in the 1930s, is now occupied by an antique store. 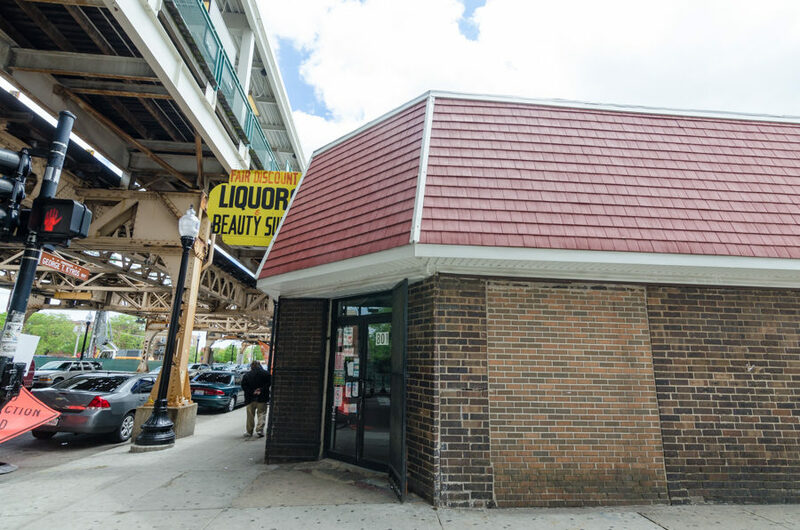 The final group of storefronts on the block, at the corner of 63rd and Maryland Avenue, are in a single-story building dating to 1909, also currently for sale. The façade is covered in enameled steel panels that were most likely installed in the 1950s, although the original wall of common brick along Maryland Avenue remains uncovered. The entrances to the westernmost stores still retain their mid-century treatment with inset doorways, display windows and linoleum flooring, while the eastern entrances have been altered more recently. 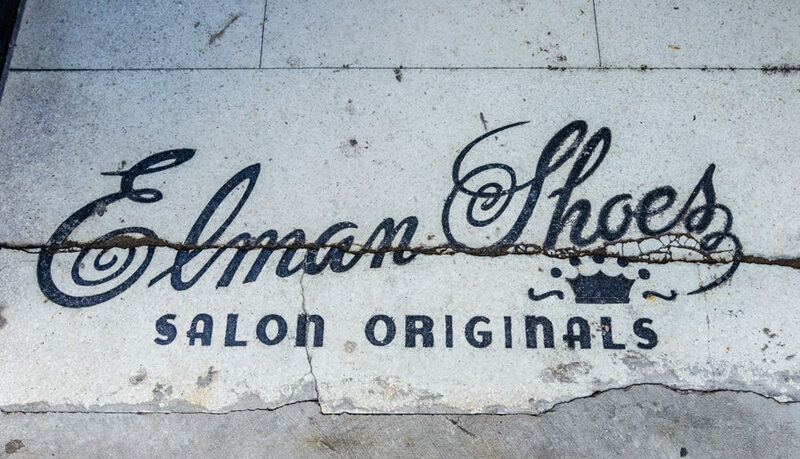 Interestingly, on the corner entrance, the terrazzo name of the former Elman Shoe store remains. In the 1970s, this was the location of Kham & Nate Shoes, a high-end shop that eventually expanded into the Hyatt Regency and four other locations, and by 1987 boasted yearly sales of $2 million. The future of these buildings looks dubious, but there is no need for a hasty demolition under the guise of ‘cleaning up’ the corner. 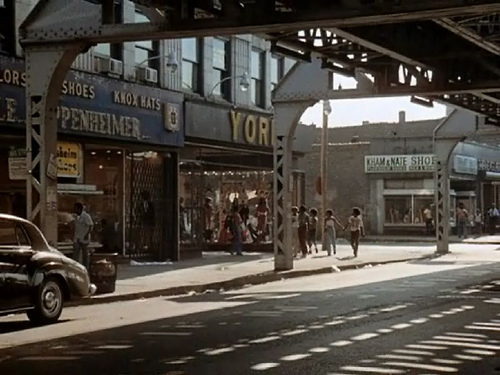 Woodlawn is bereft of commercial buildings – there are none on 63rd between Maryland Avenue and Woodlawn Avenue to the east, a distance of seven blocks. 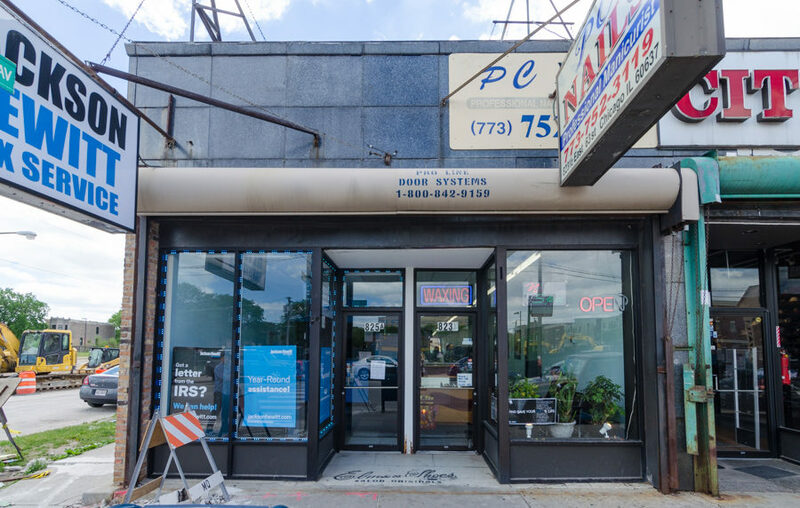 As an alternative to demolition, these buildings could be renovated and marketed to the types of independent shops that may be priced out of Woodlawn’s new developments, where rental costs will be higher. This historic corner should continue to exist and serve the neighborhood for decades to come. 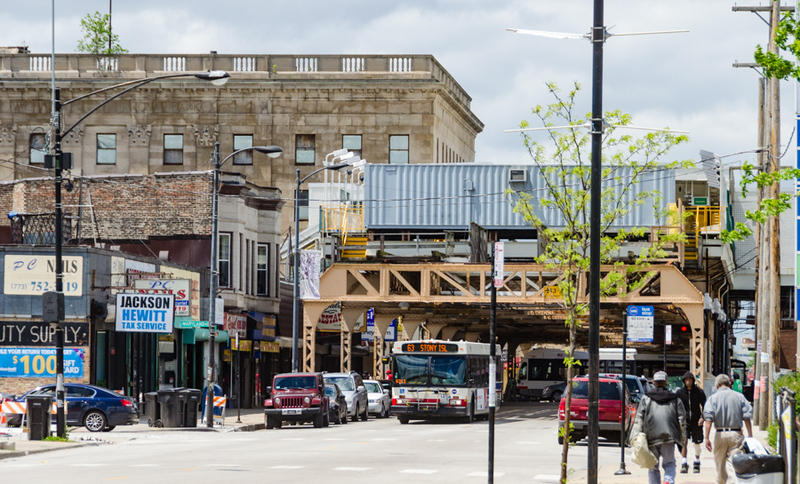 While saving a few of the older buildings might be nice, the real issues are first restoring the L all the way to Stony Island, and two, building on the vacant lots–mixed use 3-5 story buildings to both provide housing and increased retail/office space. My pediatrician, Dr. Runner, had his office at 63d and Maryland, so that stretch always reminds me of booster shots lollipops afterwards. WONDERFUL article! 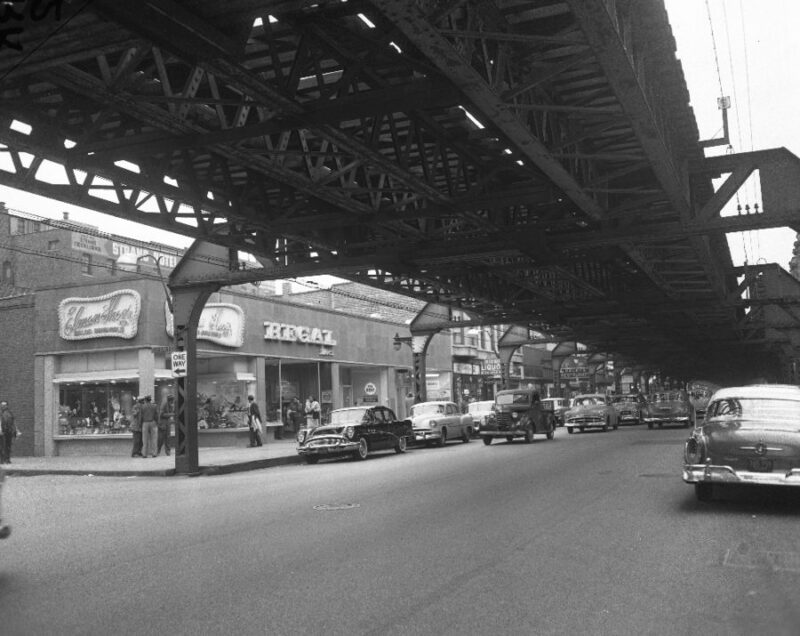 Does anyone know the name of the Rexall Drug Store that was located at that corner of 63rd and Cottage Grove? In other words, who owned it in the early 1950’s?I cannot make out the name above REXALL Drug but those stores were independently owned and always had “Johnson’s” or “Edward’s” above the REXALL Drug name. Was it FORD HOPKIN’S who owned that drug store? It was indeed Ford Hopkins. Thank you, Mike! I am researching that area for a biography I am writing about Little Donna Hightower. She was discovered in that Rexall but I was having trouble reading the name on the sign. Donna went on have a marvelous career in Europe selling millions of records but in those days, she was just a struggling cook and later an R&B singer. Thanks Randall – I look forward to reading your work and agree that Donna never got the recognition she deserved in the States. While almost all of the entertainment venues in Woodlawn have long been gone, you might be pleased to know that the Strand Hotel (only two doors south of the Rexall) has been renovated/restored. That’s good to know about the Strand. Donna got her big break singing at the Strand with Horace Henderson’s combo and that led to a recording contract with Decca Records in 1951. 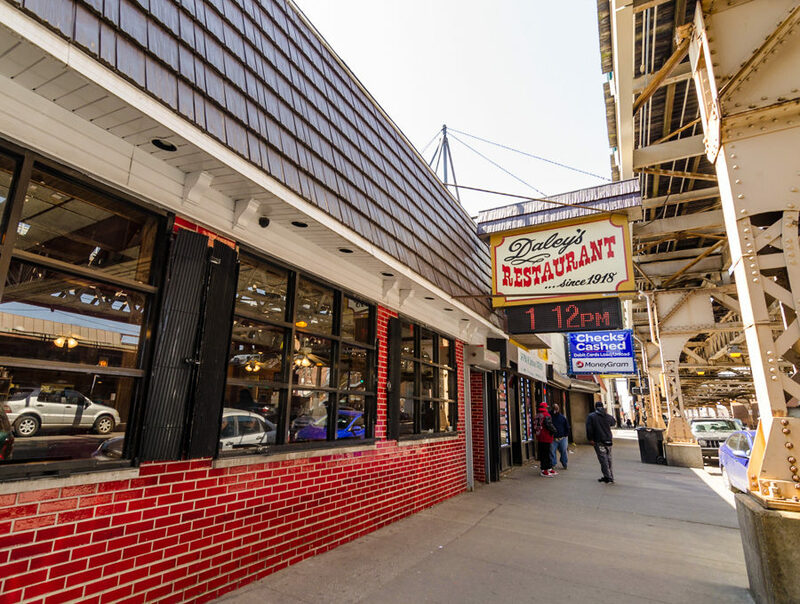 I want to travel to Chicago soon and when I do, I’ll plan on going by there and probably eat down the street at Daley’s. That will be as close as I can get to what she saw in 1951. Thanks again! Thanks for the trip down memory land! Everything’s gone and it’s a pity. A wonderful neighborhood to have grown up in when it was in its prime 1940’s! David Vartanoff, when you’re a hammer, everything looks like a rail, er, nail.